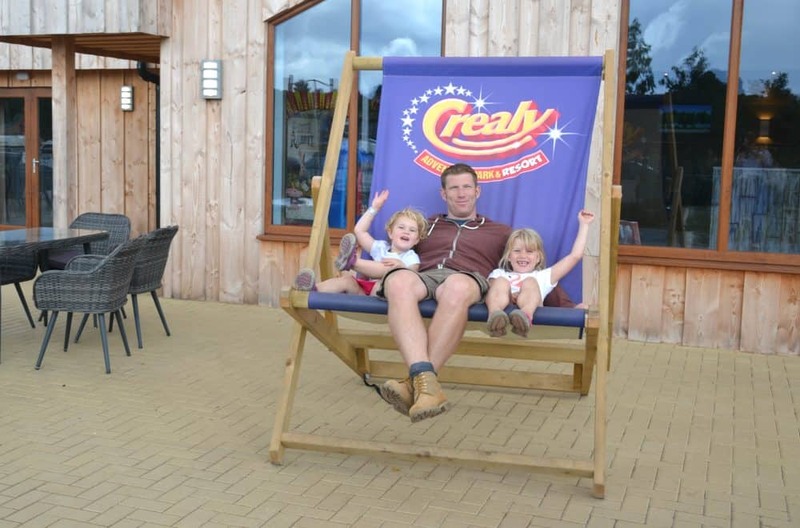 Picture the scene: you’ve just had an epic day out with the kids at Crealy Adventure Park in Devon. You rode the rollercoasters, got drenched on the Tidal Wave log flume and went for one too many spins in Nepture’s Tea Cups. Now you have to drag your damp kids back to the car for the long drive home. What a come down. But wait! There is an alternative – camping at Crealy Meadows. We towed our caravan to the Devon theme park to coincide with an invite to see the fantastic City Cirque Urban Stunt Show. This dramatic mash up of BMX-ers, skateboarders, inline skaters, and acrobats can be seen at Crealy until Saturday 1 September 2018. Here’s a taster of what you can expect and you can find out all the show information on the Crealy Adventure Park event web pages. What better way to complete our day than walking back through the secret Crealy Meadows guest entrance and chilling out at the onsite facilities? Here’s our review of Crealy’s family-friendly Devon campsite where we stayed as guests. This wasn’t our first visit to Crealy Meadows. We had a short break there in a Safari glamping tent in 2016. So we already knew this family-friendly Devon campsite had excellent facilities. However, there’s been plenty of additions since then so it was great to return to see how the campsite is improving its experience for guests. As well as having the choice of standard and super pitches you can select your exact pitch when you make your booking online. We stayed on pitch 37 which is a standard camping and touring pitch close to the centre of the site. We arrived before the 12pm check in time so were asked to park in the main car park until our pitch was ready. In the meantime we picked up our wrist bands to access the theme park and went in to enjoy a couple of rides. When we returned to the Crealy Meadows reception the friendly staff gave us a pack of information about the site facilities and entertainment. This also includes a map making it really easy to locate your pitch. All the pitches are level and have electric hook up, a water tap and grey waste disposal point as standard. Some sites would sell these facilities as ‘super pitches’ but they come standard at Crealy Meadows. The site is clean and tidy with hedges between a lot of pitches. We felt we had plenty of room for our large caravan, car and a gazebo when we put it up later in the afternoon. In 2018, a clubhouse, games court and crazy golf course have opened for the exclusive use of people staying at Crealy Meadows. The Clubhouse is open from 7am for breakfast right through to 11pm for dinner and drinks. There’s small scale entertainment here during the evenings, like quizzes, then the main evening entertainment happens over in the theme park. All food for Crealy Meadows campers and glampers is served in The Clubhouse making it really convenient to have dinner close to your tent, caravan or lodge if you fancy a quieter evening away from the action. We visited The Clubhouse for dinner where you order at the bar and the food is brought to you. The menu has salads, pizzas, burgers and side orders as well as desserts. It all sounds like fast food but is presented very differently to the cartons you get in the theme park. We shared margherita and BBQ chicken pizzas, which came out on wooden boards, and a side of rustic fries in a cute mini bucket. There’s also a kids menu including pizzas, chicken and chips with a choice of veg, or macaroni cheese. Breakfast is served until 11am and includes things like bacon baguettes, full English breakfast and unlimited pancakes. Children can pick from beans on toast, unlimited pancakes and smaller cooked breakfasts. Character breakfasts happen on Thursday and Sunday mornings with Buddy and Blossom Bear. There are plenty of highchairs around the restaurant and the menus are designed to be coloured in, although we didn’t see any colouring pencils. Inside the entrance to The Clubhouse there are a few arcade games and outside there’s a small play area and table tennis. Crealy Meadows has two play areas but since our last visit a new multi-sports court and adventure golf course have been added. You can also hire peddle trikes or quads to ride around the site. We didn’t have time to try these out but they look great fun for kids if you’ve not bought tickets for the theme park or if you’ve exhausted the list of all the things to do in there. A go on the crazy golf costs £3 per person or £10 for a family, and hiring the trikes or quads ranges from £5 for 30 minutes to £12 for an hour depending on the size of the vehicle you choose. There’s also a programme of daily activities in Crealy Meadows from 8.30am until 7pm including a wake and shake work out, coaching sessions with Exeter City Football Club, archery and table tennis competitions. There’s a fee for some activities. From 7pm in the Devon school holidays the huge Adventure Zone soft play area with drop slides, rope swings and aerial walk ways is open for Crealy Meadows guests. This is where the events team lay on kids discos competitions and cabaret acts. There’s plenty of seating and a bar serving drinks and snacks. The girls loved line dancing with one of the theme park’s mascots, Blossom Bear, and taking part in a short game show. We didn’t quite make it to the magic show at 9pm as the girls were pooped. After that there was a disco and karaoke until 11pm. The entertainment is different each night of the week with bingo, live acts and themed fancy dress nights to mix things up. The heated toilet block is located in the front half of the site close to the glamping tents and centrally for the touring and camping pitches. I was really impressed by the modern sinks, large showers and piped music when we visited last time and remained so on this stay. The facilities were clean and tidy despite the site being nearly full. Also at the toilet block there’s a family bathroom with bath, dish washing area, and a laundry with a large freezer should you need to store frozen food. Dogs are allowed at Crealy Meadows if you are staying in a Medieval Pavilion or in your own tent, caravan or motorhome. There’s a good sized dog walk with poo bins. Be aware that dogs aren’t allowed in Crealy Adventure Park but it is easy to pop back and check on them in a well ventilated caravan or motorhome. I wouldn’t leave a dog in a tent but there are kennels you can hire if you do want to leave them while you go into the theme park. Crealy Meadows is not far from junction 30 of the M5 making it an ideal campsite on the way to South Devon or Cornwall. It’s also six miles from the centre of historic Exeter and a stones throw from East Devon’s Jurassic Coast. There’s plenty to do in the area as well as the fun of the theme park. Touring and camping pitches cost £60 per night in August including two adults, two children, a dog, and and awning. A standard pitch is 10m x 10m, has electric hookup, and a water and waste water point. Super pitches are and extra £10 per night and are slightly larger at 12m x 12m, but come with similar facilities. Park admission is not included in these prices but can be bought at a discounted rate when you make your booking. You can also add on breakfast in The Clubhouse. If you stay in a safari tent, Medieval pavilion or lodge then theme park entrance is included in the price of your stay. More information about all types of accommodation at Crealy Meadows is on the website. Our girls love days out at Crealy and are always sad to leave. So from our point of view it was brilliant to be able to tempt them away from the park with the promise of more fun in the evening. We also exchanged that long drive back to Dartmouth for a quick escape to our home from home a few hundred meters away. It was ideal when everyone was flagging from all the fun – though it does take a lot to wear out this pair! We really rate the touring and camping site at Crealy Adventure Park. It’s modern, well laid out and has plenty of activities for families whether you are there for the theme park or not. The price of the pitches and other accommodation reflect the standard of the facilities. This is a family campsite so is not somewhere I’d recommend going for a quiet, child-free weekend. But having said that we experienced no problems with noise late at night or rowdy behaviour despite it being the middle of the school holidays, so very busy. Crealy Meadows is the perfect choice if you’re looking for a family-friendly Devon campsite. Disclosure: we were guests of Crealy Meadows and Crealy Adventure Park. All opinions are my own and those of my family.